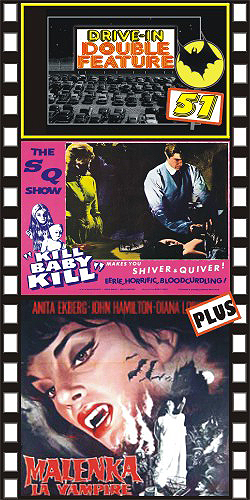 KILL BABY KILL (1966) Erica Blanc, Max Lawrence, Fabienne Dali, directed by Mario Bava. One of the greatest Euro-horror films ever made. The ghost of a young girl takes revenge on the villagers who caused her death. Swirling mists, cobwebbed rooms, black cats, shadowy figures…it’s an incredible film that you really don't want to miss. The “running from room to room” scene still packs a jolt. Beautiful color, from 35mm. PLUS: FANGS OF THE LIVING DEAD (1968) Anita Eckberg, Julian Ugarte, John Hamilton, Rossan Yanni, Adrianna Ambesi. Anita inherits a castle but finds it infested with vampires! Eckberg was a beautiful actress, and though she was still vibrant enough to pull off this type of youthful role, her beauty is overshadowed by the stunning beauty of the female vampires that surround her, especially the gorgeous Ambesi. Great color, 16mm.